In my opinion, the power difference between 87 & 91 is within margin of error. We are contributing the 'power gains' in torque due to a motor that is more broken in at the 1500 mile mark versus 800 miles. Could also be environmental factors as well. If anything I personally would have expected 87 octane to yield lower results, so this was a little bit of a surprise. 100 Octane Race Fuel should not be used as a comparison to standard pump fuels. Race Fuels may contain formulas that sometimes yield higher power outputs over traditional unleaded. 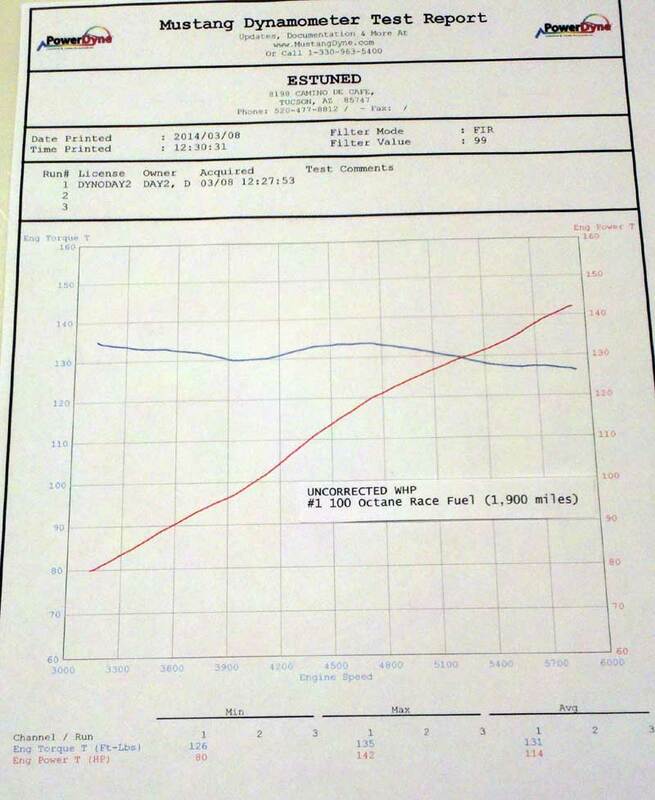 Take the corrected numbers from the 100 octane run with a grain of salt, the correction factor was fairly high during dyno day. Video & Sheets are below. Since I was allowed a single printout on dyno day, I opted for uncorrected printouts. I'm willing to bet the 180ft/lbs corrected number in the video is suppose to be 150ft/lbs, that may have been a miscommunication to the person writing the results on the board. Datalogged output using Torque Pro on my phone, just a tick under 20psi at the peak using 91 octane, and 19psi using 87, I haven't analyzed the logs from 100 octane yet. It's amazing how flat the AFR's remain. Direct injection allows for some impressive mixtures under boost. The dyno operator never veers from the analog inputs. I have pictures of these environmentals from both runs. If anyone is interested I can post them as well. I'm surprised by the hp results, 20 more than manufacturers spec... At the wheels! Impressive. Waaayy out in the country, leave your GPS at home, I ain't on there!! Man that is some great numbers from 1.0L , very nice linear climb in power along with rpms, Ford hit this one out the park!! Thanks for taking the time to strap it down and post. 13 VG S "PLAIN JANE"
Are there any mods out there yet for this car? The HP is only 35 or so less than a stock Fiesta ST. 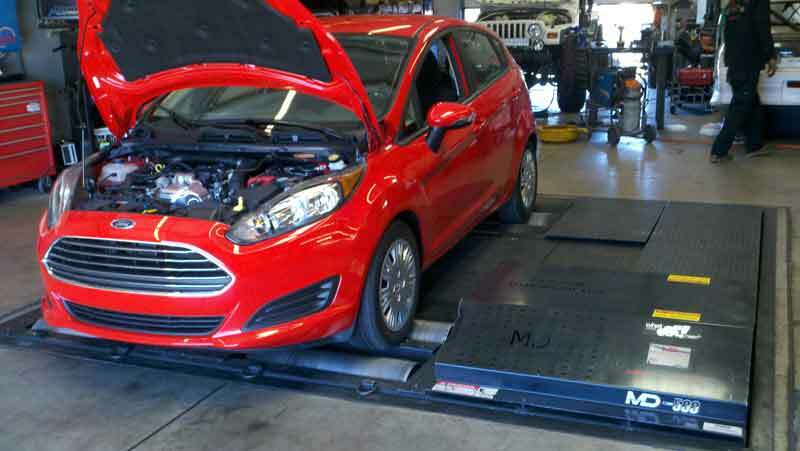 The torque though is no where near a Fiesta ST. That one extra cyl does the trick! I'm wondering what it would take to get to the 180 HP range to equal an ST? Still couldn't compete without that torque, but would be nice to get into the 180 ballpark. Probably takes a lot though. What will your first mod be?? PS. I'm soooo darn close to getting a red 1.0 like yours!! Just can't see paying $600 dealer doc fees and so far they won't budge!! Argh!!! Last edited by Neat Engine; 01-11-2014 at 09:55 PM. .........I'm wondering what it would take to get to the 180 HP range to equal an ST? .....What will your first mod be?? 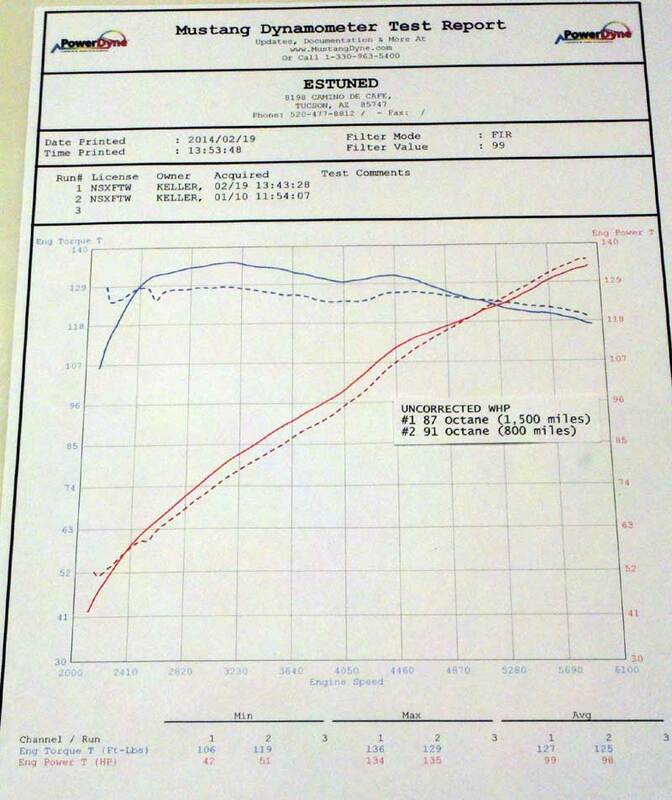 I don't think the 1.0L will ever get to the ST performance levels and maintain the reliable and/or cost factor. The ST is so much more of a car all around. It'd be like chasing an uphill battle. At 180whp I'm almost certain would require a higher octane fuel and maybe a larger turbo, running that would only be realistic at the track. Driving around on $7.50/gal 100 octane fuel would be expensive. However, I may be able to squeeze more low end/midrange torque by throwing more boost at it. But up top you can see the tiny turbo is running out of breath above 5,000 rpms. I hear ya on a new car purchase. It makes no financial sense on purchasing a new car. Throw in 1st year registration, sales tax, insurance, and depreciation it's a bit of a hit right away. You're better off waiting a couple years and pick up an ST or 1.0L Ecoboost second hand. My reason for buying this specific car was purely emotional. It's almost like a win for the Americas that we finally start getting a taste of what's offered overseas. I just hope the 1.0L is a success to a point where plenty of them are available to second hand purchasers for both performance enthusiasts and ecomodders. It's quite a fun car. I'm waiting for SCT and Superchips to have something available. I need a way to tune the ECU before I start throwing bolt-ons at it. I'll update the thread under the performance section as I make mods. Edmunds dynode an ST and recorded well over the factory rating. Wow that's surprising! How much of the numbers do you think had to do with using 91? Oh yea I realize the 1.0 will never catch the ST. Was just curious as to how much it would take to get to 180HP on the 1.0. Like you mentioned, A LOT haha! And I'm sure few owners will ever try. I'm buying for some of the same reasons as you. There are other choices out there for me, including a regular Fiesta SE, but I really like how unique this car is. I've only had forced induction cars in the last two decades or so. I'd like to keep it that way even if it's a 1.0 turbo. And I personally don't think it will be around very long if Ford sticks with a manual transmission. I tried getting a new Civic LX, but at 2 dealerships I was told they won't ever order a manual again unless it's a custom order. America has spoken and the manual transmission is out. Sad to me, but I'm obviously in the minority. Can't wait to see your next mods. 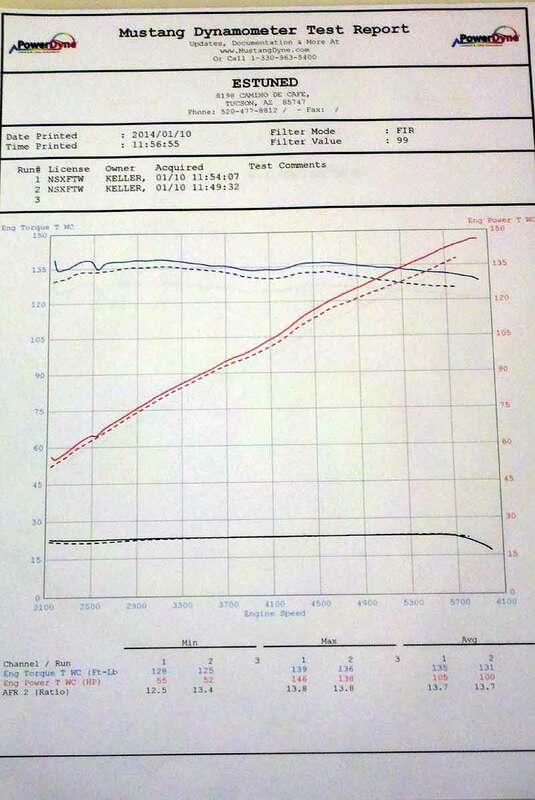 And the 87 octane dyno! PS. Are you going to stick with those stock wheels?? How many miles were on the car? Just say no to fart cans. I'm really curious about 87 octane numbers as well. It'll take me about a month to go through this tank of fuel. I have no way of measuring the knock count, I can't say how much 91 octane played a role at producing such high numbers. 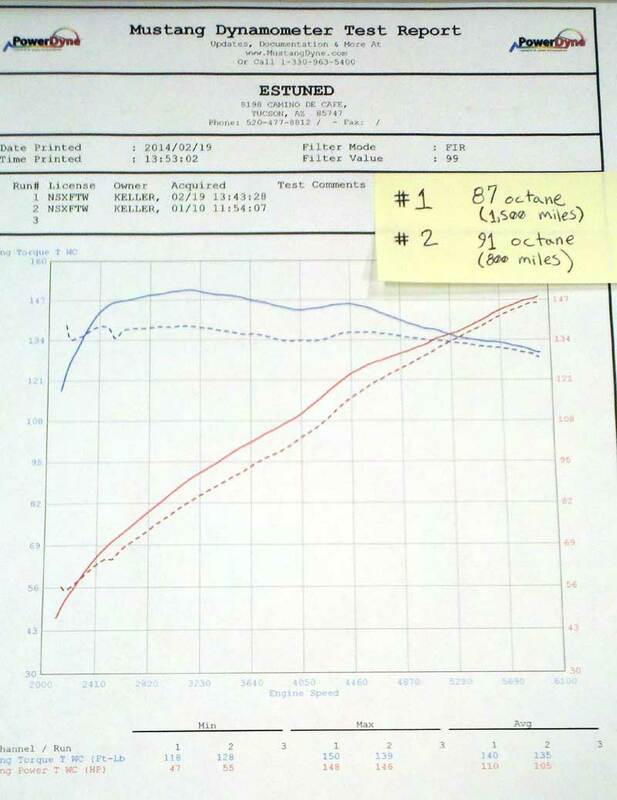 Maybe Ford publishes hp/tq numbers using low grade fuel??? As far as the wheels, oh god no, they're hideous. I begged the dealership to let me buy the stock SE rims and tires and they would not budge. I'll wait until these tires are worn before that upgrade. It needs tint before summer rolls around. The vehicle has about 800 miles on it.